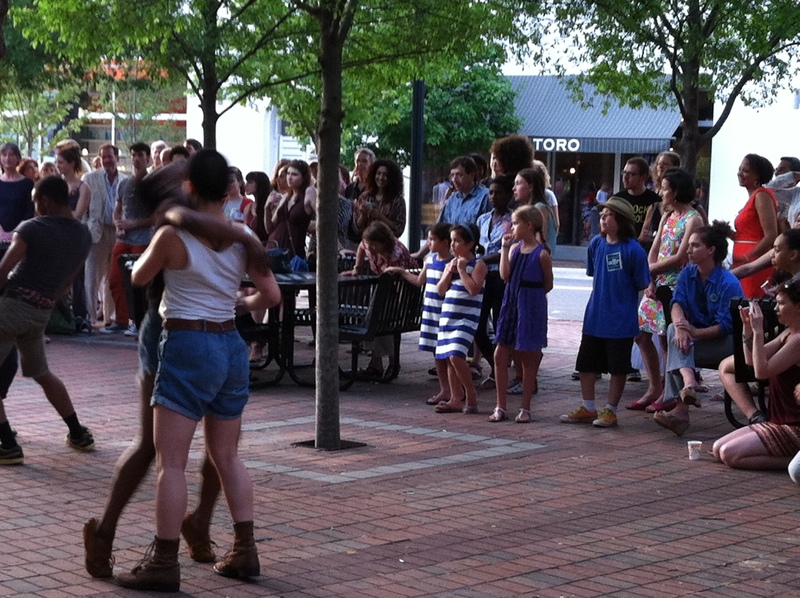 ADF student dancers improvising at Five Points. Continuing its joyous spread into the Durham community, the American Dance Festival teamed up with the recently-opened Pleiades Gallery at Durham’s Five Points for a fun pop-up event. Pleiades is showing dance-themed art in its current show of work by co-op members, but on the 27th several of the wonderful posters designed each year for the dance festival were on view as well. The small bright gallery boiled with people as the student dancers and hard-core ADFers packed the place, sipping drinks and scarfing up the snacks provided by downtown businesses like Loaf and Pizzeria Toro, right next door. 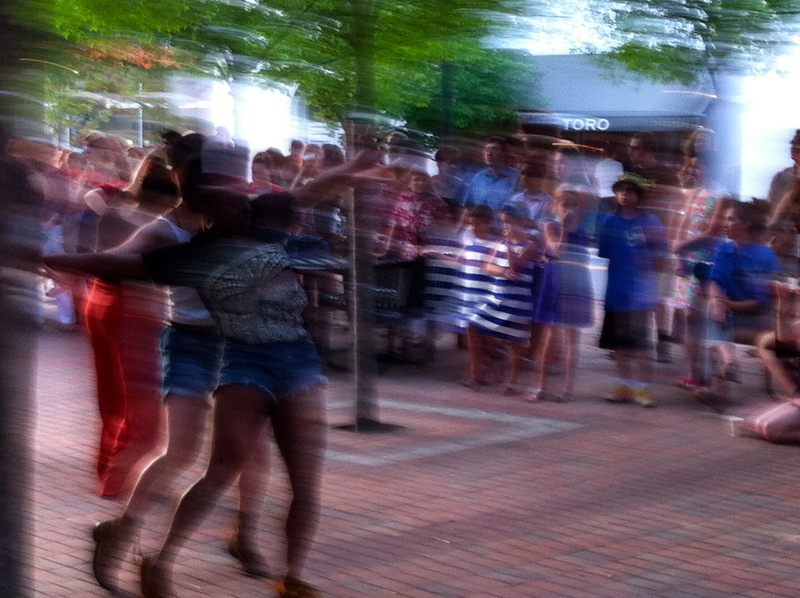 The dancing began inside Pleiades Gallery, just out of the frame, right, and flowed into the Five Points park. Music began; the crowd pressed back toward the walls, and the dancing started. After one improv dance in the gallery, the students surged outside. The crowd followed, across Chapel Hill Street into the Five Points park, where there was considerably more room to turn around. 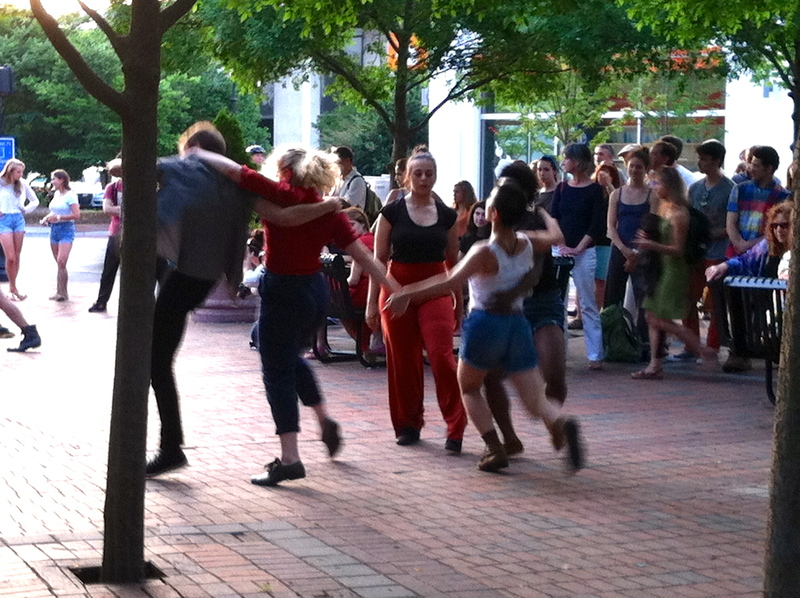 Undeterred by brick, the students jumped and twirled. I even saw somersaults. It was a not a piece of choreographic brilliance, but it sure was sweet. In the park, various surprised people stopped to watch, uncertain but smiling. On Main, a flock of bicyclists wheeled by, waving. The downtown bike cops looked on benevolently from the point, and stopped cars when the dance ended and the people flowed back into the gallery. It was a festive hour for the Festival.